The evolution of Saxon and then Anglo-Saxon Britain and the demise of the British peoples is almost all due to a fairly unknown leader of only half of the Roman empire called 'Honorius'. Which is by way of saying that it was nearly all his fault. This is how the Anglo-Saxon Chronicles, and the later Anglo-Saxons viewed the first arrival of 'their' people from the migrations from Germany following the collapse of the Roman Empire, effectively legitimising their claim to the land. Until quite recently, this was the accepted view of what occurred. However, recent research has shown it to be incorrect in almost every aspect. There is no corroborating evidence to show that Hengest or Horsa ever existed, or even if they were actually the same character. The reasoning for this statement is that Hengest is recorded in two other Anglo-Saxon literary sources: Beowulf and The Finnesburh fragment. These go a long way to suggest that he probably did exist, but matters are confused because 'Hengest' and 'Horsa' both mean literally 'horse', with Horsa just being an alternative name for Hengest in another dialect. Hengest was recorded as having been the first Germanic chieftain of Kent, but it was likely he was probably little more than a warlord. The first truly Germanic king was probably his heir Oisc, bequeathing the name of the Oiscingas on the Kentish royal household. 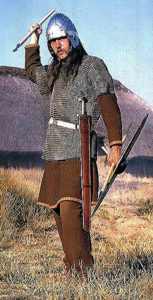 A British king who may have been called Vortigern employed Germanic mercenaries to aid him and his local militias in his battles against the Picts who in reality may have been just another tribe and yet another British sub king. This was not the first instance of Germanic settlers in this country, as it is known that Germanic troops had been stationed in this country by the Romans since at least the third century. The peoples on the fringe of the Roman empire had always been employed as border troops, so this was not as unusual as it might first appear. There were plenty of reasons to become part of the Roman military machine even then, despite the terms and conditions that they expected from the individual. The real surprise is that they practised a system where it was foreign troops that were employed who exercised a certain amount of impartiality, and were employed as 'Foderati' (mercenaries in the Roman army). It was also common practise for these troops to settle in this country. Germanic pirates were also raiding Britain from at least this date too, so via reconnaissance the 'excellence of the land' would have already been well known on the continent. Archaeology demonstrates that by the late fourth century Germanic mercenaries had settled all along the east coast of Britain, and along the track of the Thames and up as far as Oxfordshire. The archaeological evidence used to be read suggesting that the successful Germanic tribes expanded across Southern and Central England. However the spread of these tribes is more likely just to have been the nobility of these invaders and was probably more due to intermarriage, and the transfer of power to 'Germanic' male lines, cancelling out previous British ones. From here the families that received 'Germans' into there midst took on the aspects of their new leaders. There was a fear of Roman invasion from Gaul to remove the 'tyrants', so some of the Saxons stationed in southern England may have been an insurance against any Roman military intervention, which flies in the face of the 'Britons lamenting the return of the legions to Rome'. The picture is far more complex regarding the make-up of the 'Anglo-Saxons' with far more than just the three groups previously mentioned. There were Jutes (probably not exclusively from Jutland as many people think, but also from the Frankish Rhineland). There is some debate as to their exact origins, since linguistic evidence suggests they came from Jutland, however this may be entirely coincidental, whilst the more secure archaeological and land divisions evidence suggests an origin in one of the northern Frankish realms, around the mouth of the Rhine. It is also probable that the leaders of the Jutes may have originated in Jutland, having served as mercenaries in Frisia or the Rhineland; resulting in their followers being a mixture of north Danish Jutes, Franks and Frisians. The Saxons from northern Germany and Angles from the border regions of Germany and Denmark, may have formed the majority of the migrants. There were Frisians from the Netherlands whose Frisian language shared all the more distinct international changes which help to distinguish English from German and also the Scandinavian languages. From Gotland and south-east Sweden came the Geats, Norwegians, Franks from northern France and central Germany, Wends from the southern Baltic coasts, and many others. The solely brutal nature of their arrival is now believed to be very exaggerated. No doubt there were occasions when the newcomers did battle against the Britons or 'waelas' as they were known in the Old English tongue, a word meaning slave or foreigner. Much of the settlement seems to have been quite peaceful with farmers and craftsmen integrating themselves into existing communities. The numbers of invaders were certainly large, and they did alter the character of British society, to the extent of replacing the primary language. The key element here is that they did not wipe out the native British. One line of thought is that the graves found in early Saxon cemeteries with no grave goods may in fact be the remains of Britons who lived along side 'Anglo-Saxons', and the lack of finds represents the differing burial customs of a people who had a Christian framework. If this is true then the number of Germanic migrants may not have been anywhere as great as was imagined, perhaps only replacing the middle and upper strata of society. It could also be that some of the 'Anglo-Saxon' internment's may actually be native Britons who adopted the lifestyle of these interlopers, just as the Romans had done several centuries earlier and vice versa. It is most likely that a combination of all these instances occurred from solely British, through an amalgam of both peoples to again solely Saxon. Post Roman cavalryman. Could this be how Arthur looked? Whatever the nature of the influx of these new peoples, it's a fact that it did not happen overnight and that it was not entirely conflict. 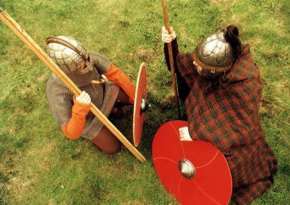 A half century after the given arrival of Hengest there was still fighting going on between the Britons and the invaders to control areas of land. This was the time of a certain Ambrosius Aurelianus who is a likely candidate for King Arthur of legend. 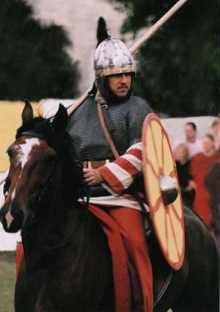 He was a Romano-British chieftain who may have led a cavalry unit in the style of the old Roman 'allas', which might account for the varied number of sites where the 'battles' occurred. Even during the most turbulent periods, the Germanic tribes and their allies still found time to indulge in their own disagreements for supremacy. Around the year 500 A.D. the Britons who may have been under the command of Ambrosius Aurelianus triumphed over the Saxons at 'Mons Badonicus' (Mount Badon, a site which has never to date been securely identified) which halted the Germanic tide. This had a knock-on effect according to several continental sources who suggest that the expansion switched to northern Frankia, tempting Germanic peoples to leave England for easier gains there. One other effect this had was to cause many Britons to leave these shores for northern Gaul, turning the peninsula of Armorica into Brittany. There was relative peace with British rule over the western half of the country and Germanic rule in the east for the next fifty years, and it seems likely that the Britons may even have regained some areas of central England from the Saxons. By the middle of the fifth century a second wave of colonisation by the Germanic tribes ended with most of lowland Britain under the sway of many Germanic 'kings' founding the basis of most of the later Anglo-Saxon kingdoms. This relegated British culture to the western fringes of the British Isles in 'Dumnonia' (Devon and Cornwall) and Wales, derived from 'waelas' as mentioned above. In the north there was the British kingdom of 'Strathclyde' and the independent British kingdom of 'Elmet' which stretched westwards for many miles from the marshes at the head of the Humber, and separated the Angles of the northern Midlands from those of the plain of York. On occasion a king who managed to unite the other tribes became known as 'King of all England South of the Humber' using the term 'Bretwalda'. The first of these was 'Ælle', king of Sussex from 477 AD, next was 'Ceawlin', king of Wessex from 560 AD. Those Germanic peoples living north of the Humber are recorded as the 'Nordanhymbroron gens', or Northumbrians, whilst the Germanic peoples living from the Humber to the south coast are referred to as 'Sutangli', or southern English. The Northumbrian Angles were subdivided into two main tribes of the 'Dere', or Deirans and 'Bernice',or Bernicians. The southern English were known as the 'Lindisfaran', Kingdom of Lindsey - which may have been founded as a combined British/Germanic buffer zone kingdom some time before the traditional Germanic invasion. Further south were the 'Mierce' or Mercians centred around north Warwickshire, Shropshire and Staffordshire; the 'Eastengle', East Angles nominally Norfolk, eastern parts of Cambridgeshire and north Suffolk; the 'Eastseaxe'; Essex; the 'West Seaxe', Wessex, Wiltshire, eastern Somerset northern Dorset; the 'Suthseaxe', Sussex; the 'Middelseaxan', Middlesex; the 'Cantware', Kent; the 'Wihtland', people of the Isle of Wight; the 'Hwicce', Gloucestershire, Worcestershire and western Warwickshire; and confederation of disparate groups known as the Middle Angles in central counties of Northamptonshire and Leicestershire of whom little is known. The Romans had deliberately and for their own reasons splashed the Germanic peoples over an area stretching from Scandinavia to the Danube, and from Gaul to beyond the Vistula. Although similar in many ways to the Celtic peoples, their culture was distinctly different. For example they shared a common heritage and spoke various dialects of a Germanic language (not the Gallic language of the Celts) and they worshipped the northern, not the Roman or Celtic, deities. The war oriented, Teutonic lifestyle had become traditional amongst the tribes. They shared, according to Tacitus, a war orientated Teutonic lifestyle with a veneration for the portentous powers of sage women and a predilection for feasting and drinking to excess. These traditional features which were enshrined as 'Teutonic culture' were admired by the Germans who settled in Britain. These mores were then in turn celebrated by the Anglo-Saxons as a golden age even to them, to such an extent that we can find these antiquated motifs in literary works composed as late as the tenth century, long after any semblance of a tribal society had ended. Various German peoples demonstrably retained features in common although they were settled over a wide geographical area and long period of time, and nourished their 'barbarian' culture despite the proximity of the Roman Empire. This lack of change is useful to us when studying the early Germanic immigrants, since their illiteracy for a century and a half after settlement inevitably leaves a gap in the British historical record, a gap that can be filled, at least partially, by written accounts from outside observers. For example, 'Tacitus' Germania' gives us many details of life amongst the Germanic tribes, as do other classical texts, but we should not take their words as gospel, for they were writing for an appreciative audience who liked to be shocked at the barbaric nature of these foreign peoples. As time went by the differences between the different tribal cultures gradually became more blurred until eventually they stopped thinking of themselves as Germans; they were Anglo-Saxon or English. The English nation was finally formed in the crucible of the Viking invasions - a war for control of the country between the English and their continental cousins. The Anglo-Saxon Chronicles - Anne Savage; N. Garmonsway. 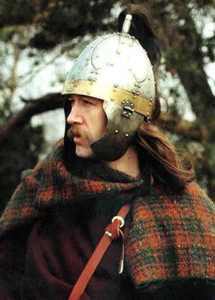 Anglo-Saxon England - Sir Frank Stenton. The Anglo-Saxons - James Graham-Campbell. The Anglo-Saxon World - Kevin Crossley-Holland. The Cambridge Illustrated History of the Middle Ages 350-950 - Edited by Robert Fossier. 'Anglo-Saxon Social Organisation' - How Anglo-Saxon society was structured. 'The Anglo-Saxon Fyrd' - The origins and development of the Anglo-Saxon army. 'Anglo-Saxon Military Organisation' - How the fyrd was organised. Last updated 31 March, 2003. Article by Roland Williamson 1999.